Laboratory services to power genomic discoveries. Get high quality results with our CLIA accredited sequencing facility. Intuitive and accurate bioinformatics reports and custom consultation. Achieve high quality DNA and RNA results with our full service clinical grade laboratory located in the United States with a comprehensive staff of PhD and MD scientists. CLIA and CAP accredited facility and State certified where applicable. Extractions are performed manually using DNA Genotek's Et-OH based extraction reagent prepIT®.L2P, or are automated using the KingFisher Flex platform. The following quality control metrics are performed on each sample: PicoGreen, a fluorometric measurement of DNA concentration, and Nanodrop, a spectrophotometric A260/280 absorbance measurement of sample purity. Full-sample or aliquot RNA extraction available. Extractions are performed using Qiagen's RNeasy kits. The following quality control metrics will be performed on each sample: Nanodrop spectrophotometry for RNA quantification and bioanalyzer electropherogram tracing for visualization of RNA integrity (using Agilent RNA6000 Nano Kit). Various applications including TaqMan single tube assays, custom TaqMan plates, real-time assays for fragment analysis (e.g., genotyping VNTRs, CNVs, indels, microsatellites, etc. ), and both Illumina and Affymetrix microarrays. TaqMan single tube assays offer the convenience of processing any sample batch size, while maintaining very high genotype call rates of ≥95%. TaqMan SNP genotyping reagents are procured from Thermo Fisher Scientific’s catalogue of tens of thousands of validated functionally tested or DME assays. If commercial assays are not available, our scientists can help design custom assays using Thermo Fisher's TaqMan assay design tools. Custom TaqMan Plates offer an economical genotyping solution for customer-specified SNP panels of >20 variants and maintain the same high genotype call rates as single tube assays. A minimum order purchase of 20 plates is required, the number of samples that can be processed per plate will depend on the final number of custom SNPs selected for genotyping as well as the customer’s desire to have samples genotyped as singletons, in duplicate or triplicate. You dedicated Services Account Manager can help choose the optimum configuration for your project. Illumina and Affymetrix microarrays allow simultaneous genotyping of hundreds of thousands of SNPs. We have a fully automated pipeline for microarray processing, and experience processing tens of thousands of arrays including; various GWAS BeadChips from Illumina, Illumina's EPICarray, which surveys >800k different methylation sites, and custom axiom arrays by Affymetrix. Take advantage of several ongoing Illumina and Axiom microarray workflows. Key features of these workflows include: (1) No upfront costs or array purchase, (2) No batch size requirement, (3) Regular batch processing for quick turnaround times, (4) Hundreds of thousands of SNP data points at competitive rates, (5) Secure data transfer via encrypted Amazon Cloud Services, (6) Customer wholly owns genotyping data. Is performed using a quantitative real-time PCR (qRT-PCR) method for absolute telomere length determination. A description of the technique used can be found in O'Callaghan, N., V. Dhillon, P. Thomas, and M. Fenech. 2008 BioTechniques 44:807-809. Choose from a custom list of mRNA targets for gene expression analysis. If you do not know what primer sequences should be used to analyze expression of your genes of interest, our scientists can help identify peer-reviewed primer sequences from the scientific literature. All assays will include constitutively expressed house-keeping genes to create a standard curve to determine up or down regulation of investigational transcripts. Various Next Generation Sequencing (NGS) platforms offer affordable solutions for both large and small studies while technical expertise ensures reliable data generation. Illumina - NovaSeq6000 offers cost-effective, high-throughput gene targeted sequencing, Whole Exome Sequencing (WES), Whole Genome Sequencing (WGS) and RNA-Seq. With the ability to outfit up to 4 different flowcells of varying capacities, this instrument offers incredible customization in terms of processing capacity. Compared to the NextSeq, the NovaSeq provides up to 25 times more sequencing capacity, and with 2 or 4 dedicated lanes on each flowcell, up to 1536 samples can be multiplexed on a single run. With a maximum run-time of 44 hours at paired-end 150bp sequencing, larger projects are completed quickly and efficiently. Illumina – NextSeq550 offers cost effective sequencing for projects with a relatively modest number of samples for either exome sequencing or RNASeq. Illumina - MiSeq is the perfect NGS platform for targeted sequencing projects. Select from various pre-designed commercial panels or design a custom panel for targeted resequencing. Our experienced bioinformaticians are able to work with raw data that is generated through our wet lab services or that has been generated at another facility. We use a robust, version controlled pipelines for data analysis. Our analytical pipelines combine bioinformatics tools and software engineering best practices, like containerization and cloud computing. This allows us to provide fast turnaround-times for both smaller and larger studies, while maintaining complete version-control of all aspects of the analysis. Full service clinical grade laboratory located in the United States. Comprehensive staff of PhD and MD scientists. Fully validated standard operating procedures (SOPs) are used with a number of automated and manual extraction approaches to obtain the highest quality and yield of DNA regardless of sample type. Quantitation – Fluorescent quantitation is commonly used to accurately determine the amount of double stranded DNA in a sample. We use a method involving the fluorescent dye PicoGreen to quantitate all samples that we extract. Purity assessment - An A260/A280 ratio is commonly used to assess the purity of a DNA sample following extraction. This can be accomplished by determining the ratio of spectrophotometric absorbance of the sample at 260 nm to that of 280 nm. We perform this assessment using a NanoDrop instrument. Integrity assessment - DNA integrity is critical for some downstream applications and to assess this agarose gel electrophoresis is performed to visualize the DNA before it can move on for further analysis. A single band with high molecular weight (>23kb) is an indicator of good sample integrity and a smear or otherwise lower molecular weight sample is an indicator of poor sample integrity. 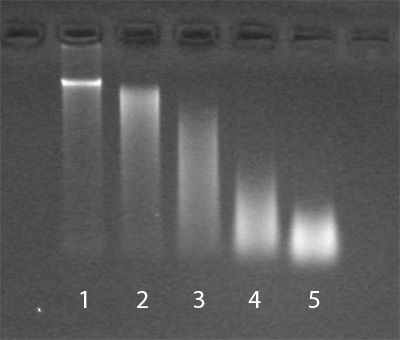 Gel electrophoresis image demonstrating DNA samples with varying integrity. A single band showing molecular weight of 23kB or higher such as the first lane (1) show optimal integrity and suggest that the sample should be sufficient for most downstream applications. Smearing and decreasing overall molecular weight such as the samples in the remaining lanes (2-5) suggests lesser sample integrity. Samples with lesser sample integrity may not be sufficient for some downstream applications. Whole Genome Amplification (WGA) – Allows you to amplify the DNA in a precious sample so that it can be used for many assays in the future without the requirement of re-collection. Aliquotting – Sample handling that allows you to have the sample distributed across multiple tubes and reduce or eliminate future freeze-thaw damage. Storage – Sample storage can be arranged for months or years depending on requirements in a CLIA accredited, environment controlled facility. Technology we use is TaqMan Single Tube assays. The TaqMan assay is an allele discrimination assay using PCR amplification and a pair of fluorescent dye detectors that target the SNP. One fluorescent dye is attached to the detector that is a perfect match to the first allele (e.g. an “A” nucleotide) and a different fluorescent dye is attached to the detector that is a perfect match to the second allele (e.g. a “C” nucleotide). During PCR, the polymerase will release the fluorescent probe into solution where it is detected using endpoint analysis in a real-time instrument. Technology we use is TaqMan OpenArray. This system involves the custom printing of the SNPs of interest onto an array and subsequent automated processing of those arrays. A technology used to assess insertions or deletions in the gene sequence. We use an approach including polymerase chain reaction (PCR) to amplify the region of interest followed by capillary electrophoresis to determine the length of the fragments amplified. This service is typically performed using a quantitative real-time PCR (qRT-PCR) method for absolute telomere length that can be found in O'Callaghan, N., V. Dhillon, P. Thomas, and M. Fenech. 2008 BioTechniques 44:807-809. Other methods may be possible, please contact our Services Coordinator for more information. Best used for targeted sequencing of large fragments of DNA (e.g. whole chromosome) and whole exome sequencing. Best used for targeted sequencing of small to midsized DNA fragments (i.e. 100-1,000bp). What services does GenoFIND offer? GenoFIND Services offers a wide variety of services including: nucleic acid extraction, genotyping, PCR- based assays, array-based assays and sequencing-based assays. In addition to extraction and downstream applications we also are able to offer a range of scientific consulting, bioinformatics and analysis services. We have access to a wide variety of platforms and qualified scientists with years of experience working with saliva samples so if you have any questions about a specific assay or analysis please contact your Sales Representative or the Services Coordinator for more information. What should I do if I am not sure exactly what type of assay is the best choice for my project? Contact your Sales Representative or the Services Coordinator for more information. Based on what you hope to accomplish we can usually recommend the most suitable technology for your project. If some background research is required a consulting scientist can review the literature from your field and make project recommendations. I am not familiar with genomics. Can you help me to understand the data once my samples have been processed? Our reports have been designed to be straightforward and easy to read. The Services Coordinator can also help you to understand the report and describe how to interpret it. If more in-depth analysis is required a consulting scientist can review your data and provide further interpretation. How long will it take for my services to be performed? The turnaround time for a project will vary dramatically depending on several factors including: number of samples, type of analysis and the queue at the lab. Typically most average sized projects can be completed within 4-5 weeks from the time that samples are received but if you require more rapid turnaround please let the Services Coordinator know. Remember the earlier you are in the queue the easier it will be to accommodate your timelines so always plan ahead. What quality control measures come standard with your DNA extraction services? More information under the Assays & techniques tab. Make sure all caps are secure for transport. Each sample must have a unique identifier written on the collection tube. For information on how to ship buffy coat samples at ambient temperature, please click here to learn about our HEMAgene•BUFFY COAT product. Your national biological sample shipping guidelines. If you are not using the HEMAgene•BUFFY COAT reagent or another means of ambient temperature stabilization, we recommend that buffy coat samples be shipped via overnight courier on dry ice. Overnight ambient or cool temperature (4°C) is recommended for whole blood samples. It is important that the samples not freeze or get too hot to preserve the integrity of the sample. An IATA trained shipping specialist. We recommend that extracted DNA samples be shipped via overnight courier on dry ice. What needs to be included on my manifest? It is critical that all components of the unique identifier are addressed on the manifest including: leading and trailing zeros, initials or other alpha or numeric annotations. Please click here to view a sample manifest. Can you store my samples? If required, short to mid-term storage of samples may be possible for your raw or extracted samples. Please contact the Services Coordinator for more information. What will happen to my samples once the work is complete? If you would like unused samples returned to you for storage and future analysis please ensure that you provide return shipping information including a courier account number at the time of contract signing. Unless otherwise stated all samples that are not returned will be retained for 30 days past the date of project completion before being destroyed. Unless otherwise stated, data will be retained for 1 year from the date of project completion on a secure server before being destroyed. If you have any questions about this policy or would like further information on the ten principles please contact: privacy@dnagenotek.com. A SNP is a single nucleotide polymorphism and refers to a change in a single base at a specific location in the genome. These point changes in the genetic code may or may not result in changes in the phenotype of the donor. Referred to as a marker, it can be used to map inherited variation among individuals, often with reference to traits. An rs# is the reference SNP ID number that is used to identify a specific location within the genome. The rs# is used to find primers and probes that specifically map to that location in the genome and will assist in determining the donors’ genotype at that position. Where can I find SNP information? Dr. Ravinesh Kumar of the Conte Center for Computational Neuropsychiatric Genomics turned to GenoFIND for the analysis of collection samples for his pilot study. See why here. "Oragene fulfilled all of our requirements for DNA sampling. It was a completely hassle free approach and we generated high quality and pure DNA for association studies and hence successfully accomplished our research project." Full terms and conditions for GenoFIND™ Services are available here.